It has been forever since I posted. How life gets in the way.... I have been busy crafting though - just haven't had a chance to post any of my projects. Here is one that I can post though - High Hopes Challenge #81 Anything Goes! I can do that! I love this stamp. I have two boys and they are the true definition of "boy"! This stamp reminds me of the time that we had an invasion of tiny frogs in our patio. My boys (especially my youngest) decided that they needed to pick up every single one of them and put them in their bug habitat. I do not exaggerate when I say that there were over 50 tiny frogs. I love my boys! Card Details: The stamp I used is High Hopes Froggy Gift which was embossed on watercolor paper and colored with Twinkling H2Os. The card is base is SU Kiwi Kiss. The other solid colors are SU Certainly Celery and Riding Hood Red. The DP is an old paper set I had from Paper Wishes. I am not sure if it is available anymore because I have had it forever!. 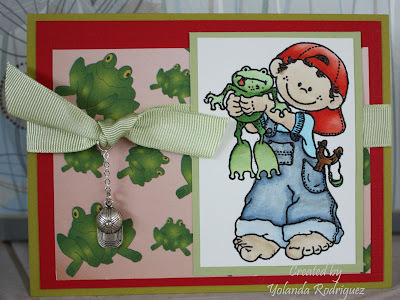 The ballcap charm is from Stamp and Create. The ribbon is from the Dollar Tree. I will probably mention the Dollar Tree alot in my posts. It's my favorite store and you would be amazed how many crafting items you get there. 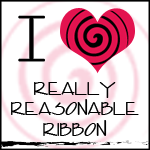 I bought a bunch of ribbon a few weeks ago. Love it! Thanks for hangin out for a little while! Adios!